Updated on 27 March 17. 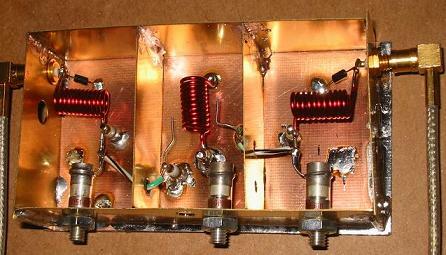 This photo shows the recommended 110 MHz bandpass filter. Click the photo for details. These items relate to the Spectrum Analyzer that K7TAU and I described in QST in Aug and Sept, 1998. To obtain the original QST articles, click here on August and September. The Tracking Generator Modifications and the 13May09 postings include information that relate to the spectrum analyzer. The following discussion includes info on an updated (recommended) tracking generator design by K3NHI and K5IRK.